Cervical cancer is the number one cause of cancer deaths in Peruvian women 15 to 64 years old. Peru's cervical cancer incidence and mortality rates are among the highest in the world, with an incidence six times that of the U.S. and a mortality rate ten times that of the United States. The majority of Peruvian women with cervical cancer are diagnosed at advanced stages when treatment options are limited and survival rates poor. Through the International Cervical Cancer Foundation, we went on a medical mission to Cusco, Peru from May 22nd to June 1st. I was accompanied by another resident and our attending, Dr. Greenspan, who is double-boarded in Ob/Gyn and Pathology. Our goal was to help deliver medical services dedicated to the early detection, diagnosis, and treatment of pre-cancers of the female genital tract. 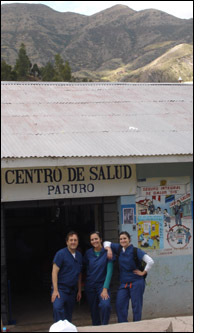 We worked in a free-standing regional clinic in Cusco called "Cervi Cusco," a play on the words Cervix and Service. Our team consisted of physicians to perform the examinations and surgeries, cytogeneticists to read the Pap smear slides, Translators, Nurses and Medical Students. We spent the day seeing women who filled the clinic lobby, some who had walked for seven hours to receive treatment. Every woman received a gynecologic examination and cervical cancer screening with a Papanicolou smear. One of our days was dedicated to working in a remote village of Peru called Paruro. This village was a three-hour drive through the Andes Mountains. We rode on a bus hugging the curves of a winding road on the edge hanging above cliffs of the Andes. One we arrived to the village we were greeted by the town spokesman who said the villagers all wanted to make us tea, coffee, and food before we began our work. However, we were eager to start our day and made our trek to the clinic. We had 4 rooms which we had to create make-shift gynecologic examination areas. It seemed that every woman in the entire town lined up at our doors. We performed 157 Paps in about 6 hours. The people of the village were so grateful and insisted on making our team lunch. They prepared a big feast of rice, potatoes, and Alpaca, which is a Peruvian specialty similar to the Llama. The mission to Cusco and Paruro Peru was an incredible experience. I met so many fascinating people from all around the world. It is wonderful to feel that you were able to impact the medical care and lives of so many women who may have not received care otherwise. I have already made plans to return, hopefully someday as a Gyn Oncologist to provide even more advanced services. Viva Cusco!